Greetings from the Kitchen at YMCA of the Pines! A little introduction of myself to get things started. My name is Chef Jason. I am a professional chef and have been working here in the kitchen at camp for more than 20 years now. I oversee the food services for all three of our Summer Camps (Ockanickon, Matollionequay and Lake Stockwell) as well as our Outdoor Center, and all sorts of other events here throughout the year. At the peak of our season, we serve about 2,200 meals per day! 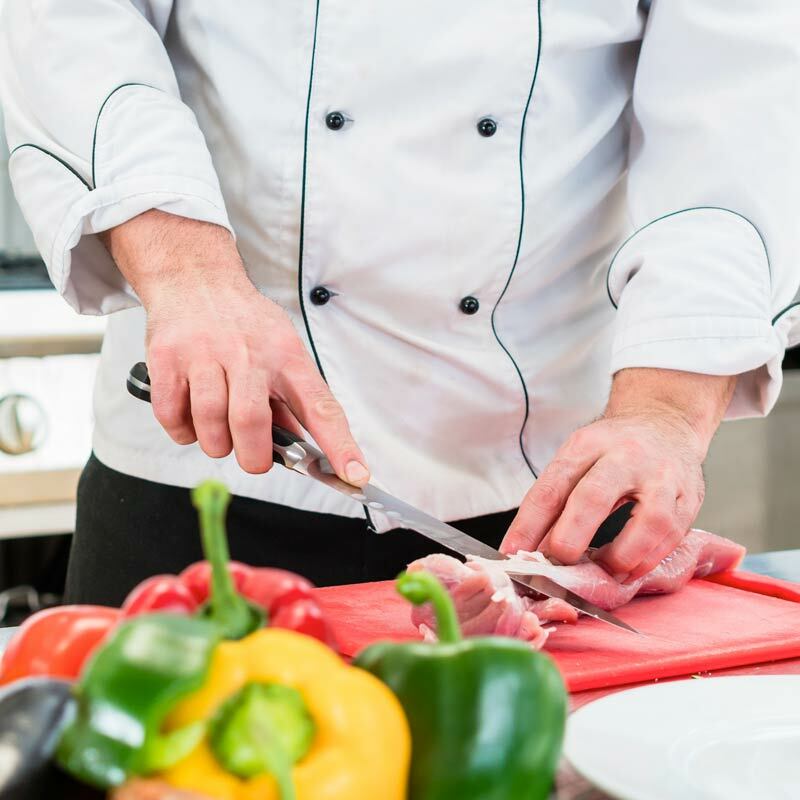 Aside from my many years of experience and service here at Camp, I continuously maintain a certification as a ServSafe Food Protection Manager and hold a certificate in a specialized Allergens course through ServSafe. Our menu offerings from the kitchen are kid-friendly with a few surprises here and there to offer children the ability to expand their pallet and try new foods. Serving foods lower in sugar and NO foods with any of, what we’ve grown to know as “the bad sugars,” including fructose, sucrose, etc. … basically all the “-ose” sugars. And we don’t serve anything with artificial sweeteners, either! We do not deep fry anything here at camp … and haven’t for more than a decade now. We also don’t serve anything that has been pre-fried, par-fried, flash-fried or fried in any way before it gets to our table! We serve whole grain items as often as possible! Thanks to the crack down on trans-fats in the food industry that began years ago, we serve no products that contain trans-fats. There’s always the option for a make-your-own sandwich during lunches and dinners. Our sandwich bar features soy nut butter and jelly, as well as cold cuts and cheeses, and our salad bar has all the fixings to round out a perfect sandwich meal. Here at camp, sometimes it’s the little details that really make the difference at a meal. Cereal and milk, fresh fruit salad, yogurt and hot oatmeal are standard options at breakfast, aside from the hot entrée. 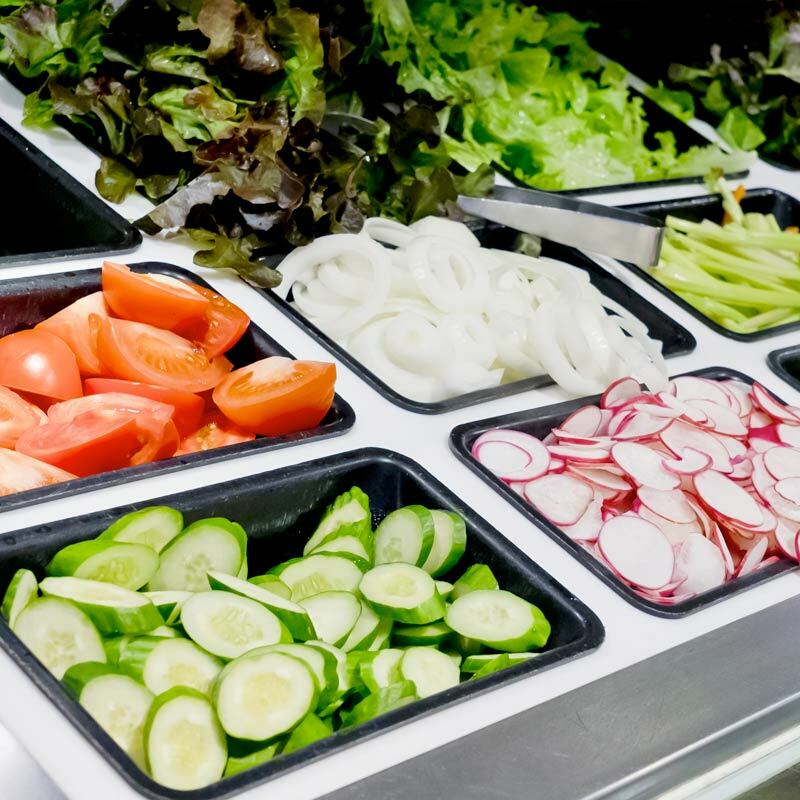 We serve a gorgeous, fresh salad bar at both lunch and dinner which includes fresh cut romaine lettuce, cucumbers, tomatoes, carrots, onions, various types of olives, pickles, multiple types of beans and whatever else we can squeeze on there! Other types of salads, soups and side dishes often appear to accompany meals here at camp as well. There is always fresh fruit available in the dining hall at all times of day … apples and oranges and whatever else might be in season. A great grab-and-go snack during a busy day at camp! Our Food Service Department is sensitive and accommodating to allergies of all shapes and sizes. We currently label ourselves as “Peanut Friendly,” and through extra training, we are extremely conscientious in operating an allergen-safe kitchen. I am knowledgeable and experienced with various types of allergies and sensitivities, special diets and dietary restrictions. But we know each case can be unique. While we cannot claim to be 100 percent peanut free, we make every effort to accommodate to the extent possible. If you are sending your child with food-related issues to camp, I would kindly ask that we have a one-on-one conversation ahead of time. It is my goal that everyone has a stress-free, safe and enjoyable dining experience here at camp. Together, with your support, we can make that happen. Please contact me to discuss food allergies or any general inquiries about our food services via email at jason@ycamp.org, or by phone at 609-678-1530 (direct to my desk in the kitchen)! Questions? Ask Our Food Service Director!